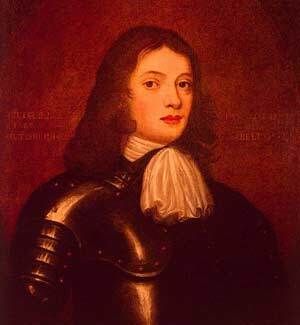 The son of a successful British admiral, William Penn displayed an interest in religion from a young age. As an undergraduate at Oxford University, Penn caught the attention of school authorities when he visited a professor who had been dismissed for teaching humanism, a forbidden subject. Undaunted, Penn criticized the elaborate ceremonies of the Anglican Church and protested compulsory chapel attendance. At age 17, he was expelled. Under the influence of the Quaker missionary Thomas Low, Penn underwent a mystical experience, later recalling, "The Lord visited me, and gave me divine Impressions of Himself." In 1667 he joined the Society of Friends, or the Quakers. Founded in 1647 by George Fox, the Quakers believed that all persons were equal before God and guided by an indwelling "inner Light," the Holy Spirit. Like the Puritan dissident Roger Williams, they opposed any attempt to restrict individual conscience. Church services were simple and unadorned: There were no ministers, no sacraments and no liturgy. They refused to swear an oath of loyalty to the king, to pay tithes to the church or to bear arms. In Anglican England, Quakers were considered heretics and were subject to arrest, persecution and imprisonment. Penn himself was imprisoned six times. From his cell he wrote a passionate case for religious toleration titled No Cross, No Crown. In 1670, he completed The Great Case of Liberty of Conscience an argument against intrusion of civil authority in matters of religion. Over time, Penn produced a series of tracts, books, treatises and pamphlets, creating a canon that articulated Quaker beliefs and principles. But persecution of Quakers continued. Thousands were sent to prison. Penn began to envision a solution to the "Quaker problem": a new colony in the New World where Quakers and good Christians could live together in a "Holy Experiment." In 1682, his "Holy Experiment" became a reality. Penn sailed to America on the ship Welcome and established Philadelphia, the "city of brotherly love," on an immense tract of land west of the Delaware River that King Charles II gave him in repayment for a debt owed to Penn's father. Christians, especially persecuted Protestants, came in droves -- Mennonites, Amish and other Anabaptist groups; German Lutherans; German Reformed (Calvinists); Moravians; Scots-Irish Presbyterians; Welsh Baptists; Irish Catholics; and Missionary Anglicans. But there were limits. Atheists were excluded; Jews and other non-Christians were barred from holding office and voting. The experiment faltered. Religious differences spawned political factionalism. In the Legislature, the Quaker party held the upper hand and resisted sharing power. Quakers themselves split into rival factions. Penn's trusted associates mismanaged funds. Penn was thrown into debtors' prison. He suffered two strokes, lost his memory and died penniless in 1718. Before his death, he had concluded that his Holy Experiment, his life's work, had been a failure. Yet Penn's Holy Experiment lived on. By the time of the Revolution, the population of Pennsylvania had grown to 300,000, becoming a religious melting pot where Protestants of all kinds competed freely in a vibrant, if contentious, religious marketplace.